The decision to drop from a grueling race like the Badwater Ultra isn't as easy as one would think. Rick Polito of the Marin Independent Journal writes an excellent story capturing the challenge and conflict of runner and crew as world-class Masters ultrarunner Mike Sweeney decides to throw in the towel at Mile 100 in the 2006 Badwater Ultra. Sweeney is equally bitter. "If the crew wants to mutiny me, that's OK," he says. "I'll find another crew."... At 90 miles, the edges are worn to sharp relief. The pride, the ego, the emotions, all on display. "It's an opera," Maselli says in aside. "We came to an opera." You can read the whole article here. I think it's one of the better articles on ultra running I have ever read. I've met Mike Sweeney and know he's a true champion of the sport. My hat is off to you, Mike, as well as your courageous crew. Congratulations on giving it everything you had that day...there will be other days for sure. No kidding. Check out this article from the LA Daily News that interviews Antelope Valley College Track Coach Mark Covert about his 38 year, 23 day, 130,000+ mile streak. Each morning, rain or shine, he has run at least one mile. He started in high school and hasn't stopped yet! Baltimore Orioles - the most widely known barometer of durability in sports - trails Covert's mark by more than 11,000 days." Covert just passed the existing national record by Bob Ray, but has Jon Sutherland, an old high school friend, hot on his tail with a 37 year, 83 day, 171,000 mile streak going. Talk about tenacity! One of the great things about living in Silicon Valley is that. occasionally, you get to be one of the first to see a technology that will clearly change everything. I had just that opportunity last week when the guys from Alter-G invited me to come down and try their anti-gravity treadmill. Yup, you read it right - an anti-gravity treadmill. After 30 minutes on this thing, I now know why former world-record marathoner Alberto Salazar has been raving about it - Alter-G presents a whole new approach to distance training. The G-Trainer uses air pressure to support your body weight while you run. It is surprisingly non-intrusive. The only additional gear required was special shorts that "zip in" to the air chamber. Once I "zipped in", the G-Trainer took my body weight and tested the pressurization levels, and I was ready to run a few seconds later. I punched in "80% bodyweight" on the G-Trainer dashboard, and in 10 seconds the pressure in the bubble below my waist increased until I felt 30 lbs lighter. The sensation was amazing - significantly less impact on my joints, and a floating feeling with every stride. The special shorts provided uniform support (no wedgie, that is), so I didn't feel like I had to adjust my normal treadmill stride at all. With every step, the Air Pressure Differential technology was taking 100 measurements per second and keeping the weightlessness consistent. Once I warmed up, I set the pressure to "60% bodyweight" and cranked up the speed. Before I knew it, I was running at 15 miles/hour...that's a 4 minute mile! It was fascinating that I could experience the turnover and stride length required to go this fast without breaking my body in half. Most sprinters wouldn't spend more than 5 minutes at full race pace in a season - with the G-Trainer, you could go full race pace every week. I slowed down to a 7 minute mile and cruised for a while. My posture and alignment looked good, with no adjustment required for the G-Trainer. I pictured logging some long runs at 60% support, training my aerobic system, getting my body used to a solid pace, all without having to sacrifice my joints. It couldn't replace the long run, but I could certainly increase my mileage by supplementing it. Rehabilitation - with anti-gravity support, you could begin rehab sooner and be back on your feet sooner. In fact, this is why the Oakland Raiders and Golden State Warriors both have one. Speed training - much like I experienced, you can train your body to know the turnover and stride length required to hit your top speed. Obesity aid - can you imagine letting an obese person feel what it is like to be 50 lbs lighter as a start to their conditioning? Incredible pyschological power. Training for the elderly - for those losing their ability to support themselves, they can still train aerobically. The G-Trainer can supplement up to 80% of your bodyweight. Personally, I was blown away by the possibilities. Once you experience it, you'll see it really is an unfair advantage. I expect in a couple of years we will see G-Trainers in gyms, hospitals, and more. 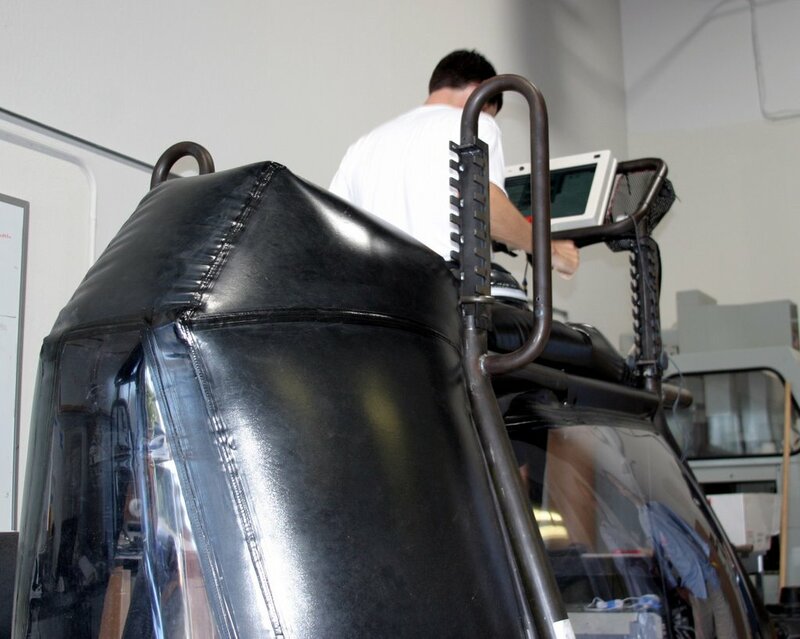 Check out Alter-G's web site to see more videos about how it works. There are even testimonials by Alberto Salazar, Robert Gallery (Oakland Raiders), and Chase Lyman (New Orleans Saints). 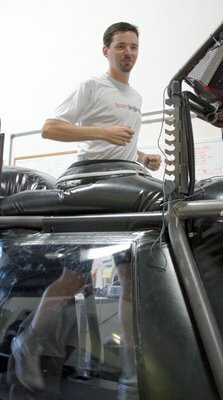 Alter-G is an ambitious young company, and they are planning to have G-Trainers commercially available in 2007. For you investors out there, Alter-G is currently seeking venture investment for expansion. For all you bloggers out there, help Alter-G by linking to this story! And since we're talking treadmills, I want to point you to this video by the band OK Go. I'll never look at a treadmill the same! "His work is part of the military's new efforts to boost significantly the ranks of special-operations forces, including the SEALs, by attracting high-endurance athletes...This year, SEAL recruiters like Goggins are fanning out to 60 triathlons, extreme-sports events and college swimming and wrestling camps." Read the full article by Online San Diego to get the rest. JULY 27, 2006, CARBONDALE, COLORADO—With 63 races tallied, the 2006 Trail Runner Trophy Series—sponsored by LaSportiva and Golite—enters its final two months of competition. And throughout the summer, early season leaders, Hugh Davis (Marathon & Shorter Division) of Tell City, Indiana, and Van Phan (Ultra Division) of Maple Valley, Washington, both maintained their positions at the top of the pack. Although not household names, these runners have amassed big points by exhibiting a willingness to travel to numerous races and placing high in their respective divisions. In its third season, the Trail Runner Trophy is the world’s largest off-road running series, and will attract over 20,000 runners from North America and Canada. Encompassing over 110 races, the Series offers two divisions: Ultramarathon and Marathon and Shorter. For complete information on the Trophy Series, including race schedule, scoring, rules and news—please visit www.trailrunnermag.com. In the Ultra division, women hold seven of the top 10 slots, with Van Phan, 35, tightening her grip on to the overall lead, bolstered by wins in the Lake Youngs Ultra, Washington (4th-place overall), a fast-paced 28.8-miler, and Blackfoot Ultra (100K), in Edmonton, Canada. Nipping on Phan’s heels is Tracy Thomas, 44, of Champaign, Illinois. Thomas moved into second with her win in the 100-mile race at the Kettle Moraine 100 Endurance Runs, Wisconsin. In third is ultrarunning heavy hitter Nikki Kimball, 35, of Bozeman, Montana, who took first place—third overall—in the sweltering heat of this year’s Western States 100 Mile Endurance Run, California. The top male Ultra division contender is Graham Cooper, 36, of Oakland, California, who also took top honors at Western States, where a dramatic finish-line incident took out race leader Brian Morrison (see Trail Runner No. 41 for a report). In the Marathon & Shorter division, cohorts Hugh Davis, 42, and Brian Beckort, 33, hail from the metropolis of Tell City in southern Indiana, and have taken to the air and road to attend Trophy Series races across the country. Recent ticks include the Lake Mingo Trail Run (7.1 miles), Illinois, and Berryman Trail Run (marathon), Missouri, where Davis took second place in his age group and fourth overall. In the same race, Beckort took first overall in a quick time of 3:22. 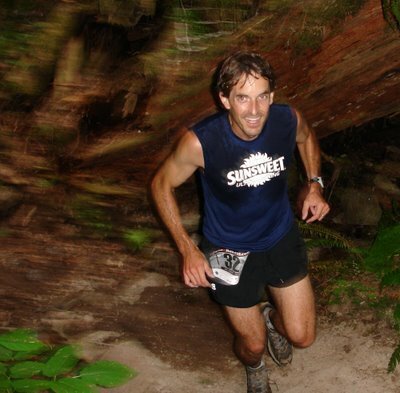 Adam Blum, 42, of Los Gatos, California, rounds out the top three, and holds the current top standing for running the most Trophy Series races, with a whopping 16 races. In the women’s Marathon & Shorter division, Annette Van Baalen, 38 of Laramie, Wyoming, has the lead over Anne Kilgore, 50, of Salt Lake City, Utah, and Gail Leedy, 52, of Laramie, Wyoming. At the Series close, we will award 18 champions each a prize package worth over $700, packed with great products from Trophy Series sponsors. GoLite sparked a lightweight revolution in 1999 when it introduced a full range of ultra-lite equipment and clothing for backpacking and other active outdoor adventures that rocked the outdoor sports world. Today the company sponsors more than 50 professional athletes in trail running, adventuring racing, mountain biking, fast-packing and thru-hiking and regularly shares fast + lite techniques in outreach seminars around the world. For more information on GoLite products, athletes, and outreach programs, visit www.GoLite.com or call 888-5-GoLite toll-free within the U.S.
Dean Karnazes isn't the only one doing 50 marathons in 50 states in 50 days this year. Sam Thompson is currently 40 races into his 51 marathon goal (read about it at his Web site, http://50in50in50.com), often doubling up on days to make up for travel days. That's why I was a bit surprised to see this press release come out on August 3rd, 2006, welcoming Sam Thompson to The North Face team. Don't you think it's odd this came out WHILE Sam was in the middle of his 50 marathons? Hmmm. Me thinks The North Face marketing empire may be making amends on this one. Think about it - The well-funded North Face Endurance50 campaign accidentally steamrollers a nice, church-going runner who is already half way through with his 50 marathons to raise money for Hurricane Katrina victims. Crisis!!! What to do?!? Quick fix - add him to the team! I e-mailed Sam to put his two cents in, as well as wish him luck on his last 10 marathons. Even if I'm right, it's hard to see how anyone loses in this scenario - lots of money raised, North Face backs them all, and two guys testing the boundaries of human endurance. It's all good. 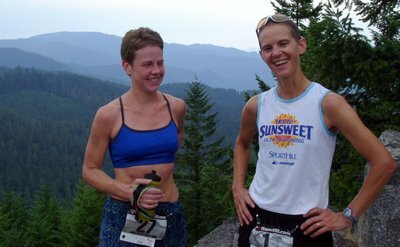 The Red Bluff Daily News wrote a great article about the 2006 Vermont 100 from the perspective of Bev Abbs. The Vermont 100 is part of the Ultra Grand Slam of the US' four original 100-milers, and like Western States, began as a horse race (although at the Vermont 100, the foot race and horse race continues to happen on the same day). Dean Karnazes won the event in 16:26:12, with Bev Abbs placing 2nd overall and breaking the Women's course record by 57 minutes with her 16:52:33 finish (and even beat the first horse!). 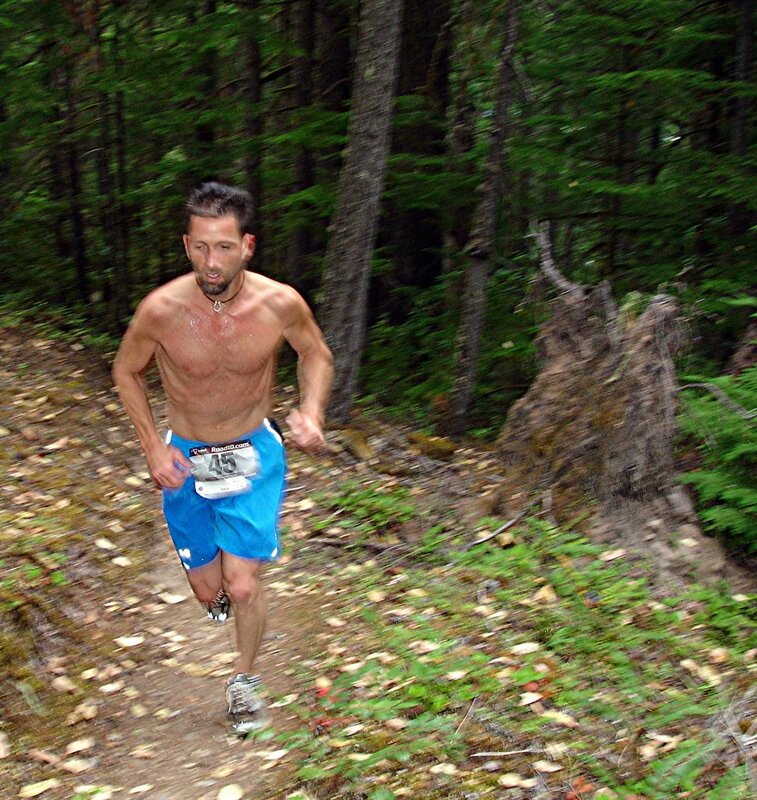 2004 Trail Runner Magazine Ultra Champion Eric Grossman, Jack Pilla, and Darcy Africa finished out the top 5. Alan Abbs placed 7th in 18:45. Bev does a great job talking through the race in this article, including running with Dean, the great work of her pacers, wrong turns, running with horses, and more. Definitely check it out. I'm also pleased to see Dean rack up another 100-miler win. If anything just to remind his critics you can say what you want, but you can't deny that Dean is a phenomenal ultrarunner. Congrats to Dean, Bev, Alan, and everybody who gave the Vermont 100 their best! 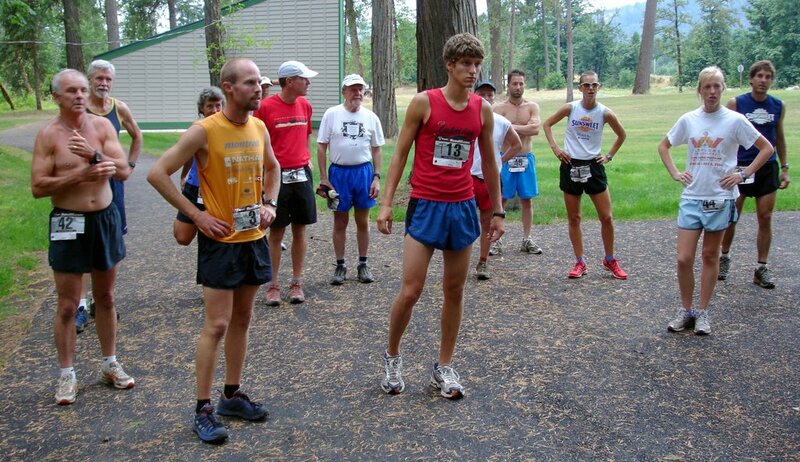 On the weekend of July 22nd, 2006, I ventured up to Oakridge, OR, for the first annual Sunsweet Trail Running Festival. This wild weekend of trail running featured four events in two days, a choice of team and individual formats, all while retaining a relaxed and communal atmosphere. The weekend was the brainchild of Bev and Alan Abbs, who took a short break from their Grand Slam to organize and host the event. Despite blistering 100+ degree heat, we all managed to have a great time. Meghan Arbogast has graciously helped to write up our experience. Oakridge, OR, is one of those sleepy little towns that is now exploding with the arrival of outdoor enthusiasts. For years I knew it as the only decent gas station/pizza parlor between Eugene and the Willamette Pass Ski Area, so I was surprised to see how much it has flourished. This weekend hosted both Trail Running Festival trail runners and mountain bikers for The Fat Tire Festival, a weeklong event featuring everything from downhill slalom to 24-hour races. As one of the local pizza parlor patrons told me “everyone comes in dirty and smiling…the only was we can tell which sport got them that is the amount of lycra they wear”. As my Dad and I warmed up for the first event (a 5-mile uphill race), I could see why the trails had become so popular. The paths were wide and well-groomed, lined with lush ferns, and hidden in canopies of Douglas fir. 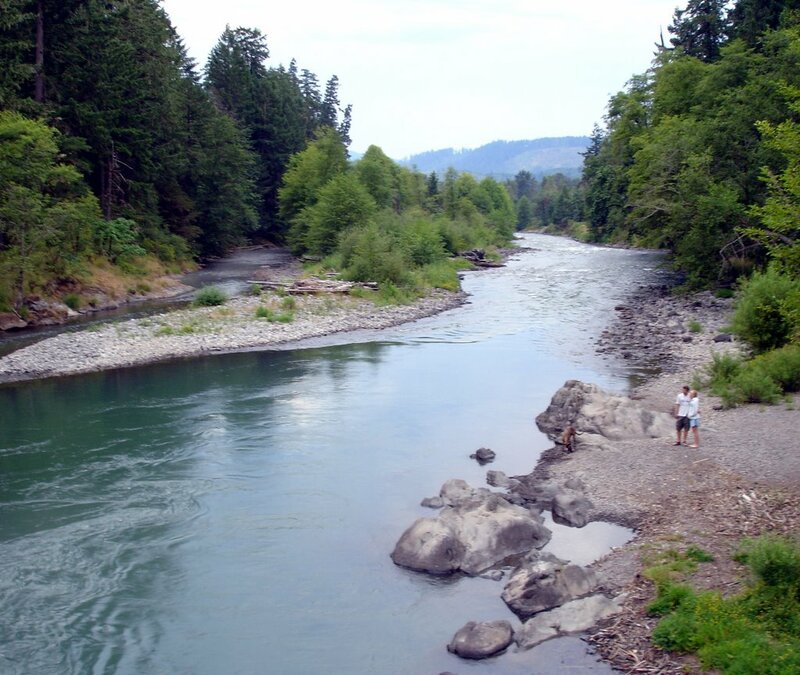 Nearby rivers beckoned with cool, refreshing water, and the views of undisturbed forests stretched beyond the horizon. It is a slice of heaven, Oregon style. I had signed up for all four races – a 5-mile uphill run, the 5-mile downhill, a 10-mile river run, and a 50k the following day. My Dad had signed up for the uphill race only, but I saw him eyeing the other races. Some of the racers we met at the start were competing as a team, with each racer picking one race on the first day, then doing a relay for the 50k on Sunday. Overall, about 40 runners were participating. One would think that “40 runners” means “little competition”, but that is certainly not the case here. Oakridge, OR, is sandwiched between running mecca Eugene, OR, and the outdoor enthusiast headquarters of Bend, OR. Among our 40 runners included 4-time Tahoe Triple Marathon winner Sean Messiner, ultra diva Meghan Arbogast (looking fresh after Western States), Western States top finisher Craig Thornley, Oregon Ultra Series winner Jeff Riley, his brother Tom Riley (who finished 24:30 at States this year), world class bowhunter Cameron Hanes, Sunsweet speed demon Lewis Taylor, and the wicked fast Oakridge High School Track/Cross Country team. One thing for sure, the pace was going to be quick! Meghan: Saturday morning began with a 5 mile race, which included a 3.5 mile hill climb through the forest with a gain of 2000 ft. A premium was offered to the first male and female to get to the base of the climb, so that guaranteed a quick start. The climb itself was long and hard. I caught up to Scott, and played cat and mouse the rest of the way up. As we finally summited (nearly 1 hour!) I turned around to see a woman had given me a good chase. That set the tone for me for the rest of the day. We began the 5-mile Oregon Adventures Hill Climb just as the sun burned the fog off the river banks. Ben Altemus, a 4:15 1,500 meter runner from the Oakridge HS Team, set a monster pace in the fairly flat first mile. When we hit the hills I was about a minute behind Ben, with the rest of the pack about a minute behind me. Sean Messiner got his climbing engine chugging and quickly passed me, setting his sites on Ben. Lewis Taylor passed a minute later, and seemed to be going even faster than Sean (of course, Lewis was running for the Sunsweet Team, so this was his only race today). Cameron Hanes, the bow hunter-turned-ultrarunner, had a strong pace going and passed me about 5 minutes after Lewis. Meghan Arbogast caught up a few minutes later, and we paced together right to the finish. Despite the encouraging chants to “not get chicked” in the final 100 meters, Meghan had me beat. She finished 5th in 56:31, and I finished 6th in 56:34. As we collected at the top of the mountain and soaked in the views, I learned that Lewis had rocketed past Sean and Ben to win in 48:08. Sean was just behind him in 48:22, and Ben got third in 48:33. Cameron had held on for fourth in 54:45. Meghan now had the lead for the Women’s title, but Jenny Knight had come in right behind me in 57:11, so Meghan’s lead was less than a minute. My Dad, Larry, came in 9th with a strong 1:03:28. We all ate watermelon, rested, and awaited the start of the downhill race in less than an hour. The 5-mile “Flying Turtle” Downhill began like a cycling time trial race, with each runner starting in 30 second increments in the order they finished the uphill race. A few new faces joined us as the teams refreshed their ranks. Most impressive was 8-year-old Dillyn Carpenter who was warming up for a race most adults would fear to try. If she could finish, she had a lock on the coveted stuffed turtle prize for the youngest runner. Jeff Riley (second runner on Lewis’ Sunsweet Team) led the pack. Sean, Ben, and Cameron were in hot pursuit at 30 second intervals. We cheered everyone as they began the fast descent, then took our places to chase after them. I descended as fast as my Inov-8 Mudroc 290’s would go, excited to have an opportunity to “let it all hang out”. I caught Meghan in the first five minutes and floored it to try and catch Cameron and Sean. The temperature was rising as we descended, and it was hovering in the 90’s by the time I hit the flat stuff. I put my head down and cranked to the finish, but was unable to catch the speed demons ahead of me. Ben “The Bomber” Altemus had won in an unbelievable 25:12 – that’s 5-minute miles on crazy switchbacks! Jeff Riley got 2nd in 26:51, with Cameron Hanes just a few seconds behind. Sean was 4th in 29:13, and I got 5th in 29:39. In the Women’s race, Jenny Knight sailed to win 30:29, gaining almost 20 seconds on Meghan Arbogast. Tom Riley came in right behind them in 31:47. Before we could finish our dip in the river, 8-year-old Dillyn Carpenter came racing in at 52:17 and got her prize. That girl has a future in trial running for sure! Meghan: After everyone made it up, Bev lined us up in the order we had placed in the climb, and set us off at 30 second intervals for the 'Flying Turtle' downhill run, back the way we came. Jenny, the woman on my tail at the top, said she was a fast downhiller. I ran fast, but she ran faster, and by the end of the morning events, I had a mere 24 seconds on her. We had a long break before the final 10-mile run in the evening, and most of us retreated to the closest air conditioned hang out. The mercury topped 102 degrees, so this last race was going to be a sweat fest. My Dad and I reminisced about the old pizza parlor, and soon found ourselves there splitting a pizza and pitcher of beer (no worries, I know I can run just fine with that kind of lunch). With a little “liquid courage” in him, my Dad decided to sign up for the 10-miler rather than hang out and wait for me. I worried that folks might drop from the 10-miler Salmon Creek Stomp due to the heat, but I should know these runners don’t back down from some stiff competition. Only a minute separated the Oakridge HS Team and the Sunsweet Team, and there was less than a minute between the two Women’s leaders. Sean Messiner had four minutes on Cameron Hanes, but Cameron had just shown us all he can go fast when he needs to. Craig Thornley stepped in for the Sunsweet Team, and Maxime Long for the Oakridge HS Team. My Dad lived up to his promise and toed the starting line, wondering how the beer and pizza were going to sit, if at all. Meghan: After the morning events, and a sit down in the Salmon Creek, I ate a big lunch, checked into a hotel, and rested up for the 10 miler at 4:00. Jenny said she would be there, but didn't feel much like racing. By 4:00, it was HOT! The clouds have given way to clear skies. The course was pretty flat along the Salmon Creek - up stream for about 5 miles which includes an out-and-back section, then cross the stream and back on a more technical trail. The pace started strong, with Craig, Maxime, Cameron, and Sean out in front. Once my muscles warmed up, I tried to push a 7:30-minute mile pace, but my body temp kept redlining and I was relegated to something closer to 9:30-minute miles. Meghan was having no trouble, and she slowly picked up her pace as Jenny Knight stayed within site of her. About 4 miles in, we hit a turnaround where I caught a glimpse of the front-runners. Sean and Maxime were up front, but Cameron and Craig Thornley were stalking them closely. Meghan was really picking up the pace now, and began closing in on the front-runners. I hit the turnaround and saw my Dad on the way back – it didn’t look like the pizza was sitting well in the heat. He gave me that “I think you tricked me into this” look, but kept moving forward. In the closing miles, I had plenty of invitations from nearby swimmers to take a quick dip and almost took them up on it. I ran the last mile with Erin Lynch, and we finished up 8th and 9th around 1:25 or so. Cameron Hanes had pounced on the pack and finished in 1:09:33, with Sean and Craig less than a minute behind. Maxime and Meghan came in 4th and 5th in 1:13, and Tom Atkins and Jenny Knight finished 6th and 7th in 1:19. My Dad had fought his stomach the whole way to finish in 1:35, but was all smiles at the finish just to know it was over. I was very proud of him for sticking it out! Meghan: Runners were wilting. In 10 miles I went through 2 full bottles of gatorade, plus drank at all 3 aid stations, and I still was a bit woozy at the finish. I had seen Jenny a couple of minutes back at the turn-around, but didn't let up, and came in at 1:13 to her 1:19. She was not at all interested in staying for the 50k the next day. We had the 2nd awards ceremony of the day, with great food and comraderie, and prizes for everyone. We returned to the hotel, and I played in the pool for awhile to cool off. At the end of the first day, the Oakridge HS Team and Sunsweet Team were within 90 seconds of each other, and Sean and Meghan had about 4 minutes respectively on Cameron Hanes and Jenny Knight. 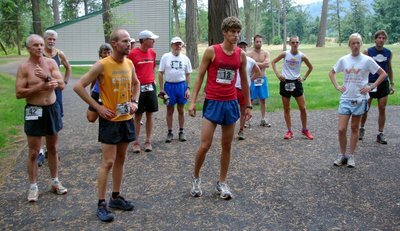 It was going to be a close match at the Westfir 50k the next morning. Unfortunately, I had to drop from the 50k in order to spend some time with my grandmother who had fallen ill (she has since recovered nicely). So Meghan will let us know how it finished. Meghan: Sunday morning arrived without a cloud in sight. Brian (Arbogast) and I were both signed up for the 50k. I was the only woman signed up for the entire weekend, so really, all I had to do was finish, but I like to challenge myself more than that. I paid for Saturday's fun with tired, sore legs, but they were still functioning. The 50k took place in Westfir, a few miles south east of Oakridge. There was only one other woman running the 50k, a handful of men, and at least 3 relay teams. After some instructions, we were on our way. 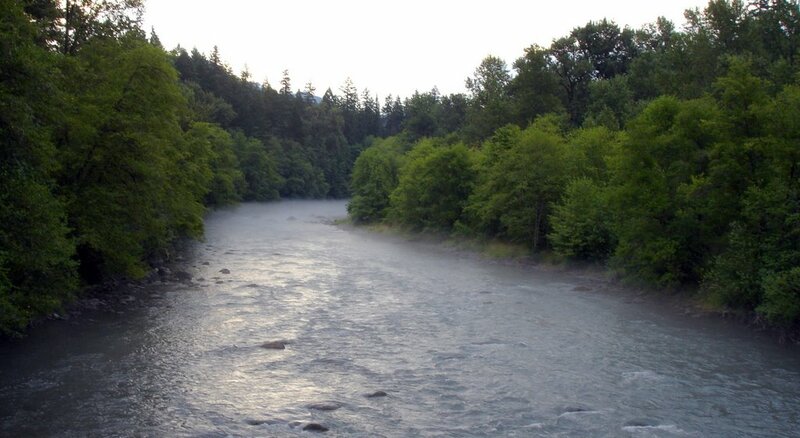 The first section hugged the North Fork of the Willametter River. Nice, single track, rolling....I eventually hooked up with Beth and we stayed together, chatting, when suddenly, the men who had led the way, were all on their way back! We had all missed a turn, and added a bit of distance, so we all turned around and ran back to a very steep, very well marked bank to scramble up to Aid 1. Beth and I tanked up, and started up the next section - a gravel road, that climbed to A2. My legs were tired, and I could plod, but she had more in her, and I convinced her to go on without me. She waited at A2, but I waved her on. I refilled my Nathan pack and continued slogging along. One of the male contenders for the weekend, Cameron, soon caught me. I was surprised he had been behind me. He said getting off course took the wind out of his sails. We ran together for awhile, and then he faded back again. This was a fairly long section of gravel road, but you could see forever. A3 finally came. I re-fueled, put ice in my jog bra and my shorts pockets, chatted with Penny, Jeff, and Lewis (Jeff, Lewis, and Craig were competing as a relay team). They sent me on my way onto what was the most beautiful section of the course, and as of now, I don't believe I have run anywhere more beautiful than this. It was 5 miles out and back, on Sour Grass Mountain. It had Old Growth, open space, meadows, rolling hills, switchbacks, and views. I was still feeling pretty tired, but stayed focused on the moment. After about 20 minutes I saw a HS runner from a relay team on his way back, and thought I must be close to the turnaround. Alas, he was WAY ahead of the next runner. I caught a relay runner, then finally saw Craig coming towards me. He was 17 minutes from the turn-around. Next I saw Beth, and realized she had the overall lead for individuals! I was jazzed. We both checked on each other, and I gave her some salt. She assured me I was close to the turnaround. I met Sean and the original race leader, and then I was at A4. I re-filled the Nathan pack again. I was going through 50-60 ounces between aid stations. I headed back out, and caught former number 1. He was not carrying a bottle, had planned on running from aid station to aid station. He eventually experienced his first DNF in 27 years of racing. I worried about Brian in the heat, but finally saw him after the turn around. He was struggling with the heat, but still looked good. He said Tom was behind him, not faring too well in the conditions. I continued on, and soon met Tom, who still had the presence of mind to shoot a picture. Finally, I made it back to A3, now A5. Craig filled my Nathan pack, Penny cooled me off with cold water, fed me gu, and they promised it was only 9 miles to the finish and it was downhill. Feeling inspired, I trotted off down the road. It wasn't exactly downhill, but it was fairly easy going, rolling for the next 3 miles. I was cruising a downhill section, noting that my feet weren't trashed, I had no blisters, I had been drinking tons and taking enough salt - life was good. I heard a voice below shout 'Hey Meghan! How are you doing?' and saw Alan. I yelled back that I was doing great (?!) and then I didn't see him anymore. How cool to have a hallucination, I thought. But I was in his aid station in moments, cooling with more ice water, and on my way again for the last 6 miles. This truly was downhill. I felt I was going at a nice pace, and heard steps behind me. 'Fresh legs coming through' he said as I let him by. He was carrying to bottles of water, and wearing a fai rly heavy looking cotton shirt. He was soon out of sight. I kept focused on moving forward, relaxing, drinking. I crossed a gravel road, and thought I must be close. Then I came to an opening and could see I was way the hell above the valley where we finish. Gulp. More trail in the woods, another gravel road, more views. Eventually, Mr. Fresh Legs came back into view. He was walking. I caught and passed him, asking if he was okay besides the heat. He said yes, and that he had gone out too fast. I kept winding down hill, and came to the face of the last hill. This was very exposed, and blistering hot. I heard a cyclist come up behind me, and made a move to let him by, but he said not to move, he was fine. I really appreciated that, as I was feeling less steady by the minute. I reached the gravel road that leads to the finish. Beth saw me coming and yelled me in. As soon as possible, I was scrambling down the bank to the river, shoes and all, where I laid down until I was cold. Beth joined me and we rehashed the event. She was first overall. Sean and I won the weekend events (well, as I said, the only woman in all 4). The times were slow with the heat (Beth ran 6:10, Sean, 6:30, I ran 6:35, Cameron Hanes ran 7:51). Brian and Tom ran in the last 6 miles together, finishing in 9:08, so Tom Riley got 3rd overall male for the weekend. It was quite a sight to see those two fried to a crisp. Alan and Bev were quick to get them down to the river to cool them off. In short, I had a blast! RD's Bev and Alan Abbs were gracious, helpful, encouraging, and generous. I agree with Meghan - this was a wonderful event. My thanks to Bev and Alan, the Oakridge HS Team who never let up, Sunsweet, and the town of Oakridge. Hopefully we'll see more of you next year!